The first annual Mini-Comics Day is happening all day this Saturday, April 9, 2011. What happens on Mini-Comics Day? Why, tons of creativity of course! 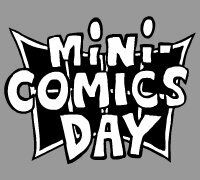 April 9th, 2011 is the date for the first annual Mini-Comics Day, celebrating the art of cartooning and creating hand-made comic books. Mini-comics have been democratizing the art of making comic books since the 70′s or earlier… with the popularization of photocopiers, it became apparent that anyone with an inclination and some spare change could print a little comic book. Wildly varying in both form and content, mini-comics are a wonderful synthesis of cartooning and hand-made art objects. The Comic Bug in Hermosa Beach will be hosting space for people to get together and create mini-comics from noon to 7 PM. Email info@thecomicbug.com to reserve your spot. Or if you’re not in the area, here is a complete list of participating stores and events. No artistic ability or experience necessary. Just a willingness to try. See Caption.org for a quick tutorial on how to make a mini-comic.